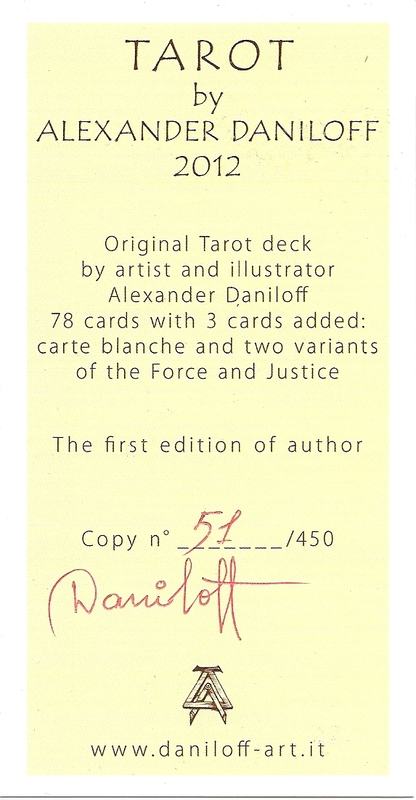 The deck came with a carte blanche and two variants of numbering Force and Justice (VIII and XI). The style is reminiscent of medieval and early renaissance paintings, with a curious detail: almost all personages seem to wear masks. 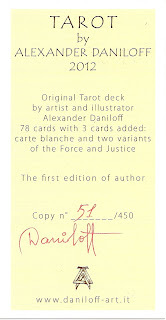 Daniloff was born in Donetsk (USSR) in 1963. In 2000 he moved to Rovigo in Italy, where he currently lives and works as a professional artist and illustrator. Daniloff on Tarot: "I have always been fascinated by the symbolism and medieval emblematic, iconography of miniatures and frescoes. 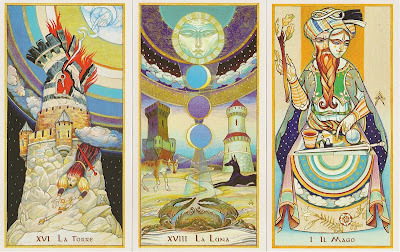 The Tarot for me have been a reason to immerse myself in a medieval atmosphere, crawl between the nobles and the miserable, oscillate between the Moon and the Sun, between Life and Death."